Today’s businesses need to be able to respond quickly to fast-changing markets, technologies and environments, and occasionally this means implementing large-scale changes across the entire business (as is the case with most digital transformation efforts). Implementing such dramatic changes successfully, however, is no easy feat. It requires seamless collaboration across the entire organisation. In today’s post, we reveal the 8 benefits your business can hope to reap with better cross-organisational work. When divisions are able and willing to share knowledge, it can significantly decrease instances of costly work duplication, as teams and individuals can gather information quickly and easily. When organisations encourage collaboration by providing the right information systems and demonstrating collaborative behaviour, studies show reduced levels of employee frustration as well as a reduction in internal disputes over ‘territory’. A business where each division is working towards disparate goals is akin to a boat with rowers all pulling in different directions – it’s not going to get anywhere fast. Where disparate teams have joint goals and a transparent system for knowledge sharing, however, measurable increases in revenue and profitability are released. Organisations with strong alignment between marketing and sales, for example, can achieve 27% faster three-year profit growth than those without. This can also lead to greater cohesiveness and employee satisfaction, as people can more easily appreciate the part they – and their colleagues – play in the bigger picture. 2x more likely to outgrow competitors. Despite this, many companies don’t actively encourage collaboration between divisions, which leads to poor communication and delayed decision-making, which can ultimately stall or even derail a transformation or innovation effort. The more information that employees have at hand, the better their ability to make good – and fast – decisions. However, if information is inaccessible or difficult to retrieve, people cannot access the data required to make quick and confident decisions. Organisations that can merge disparate systems into a unified information hub (such as an enterprise content managementplatform) make information accessible and findable whenever employees need it, and better insights can be drawn for more profitable decision making. When data is trapped in separate systems that don’t talk to each other, it becomes very difficult to aggregate that data and extract useful insights from it, meaning opportunities for innovation may slip by. There’s also evidence that suggests that collaboration helps breed innovation – according to the Australian Bureau of Statistics, 13.7% of innovation-active businesses were engaged in some type of collaborative engagement, compared to only 4.4% of non-innovation-active businesses. By encouraging a collaborative culture, therefore, businesses increase their ability to innovate. 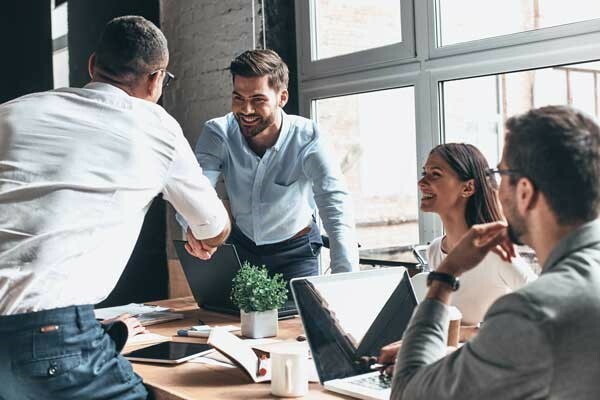 Australian businesses that consider collaboration an important component of their overall business strategy were 4x more likely to see growth in their bottom line. Employees no longer waste time looking for or recreating knowledge: Deloitte estimates that the time saved by collaborating on tasks is worth around $1,660 per employee and manager per year. Collaboration produces much better results: Deloitte also estimates that quality improvements brought about by collaboration are worth around $2,517 per employee and manager per year. Breaking down silos paves the way for innovation: Eliminating knowledge silos means better insights and faster decision-making, so businesses are agile enough to outpace their competitors. A business’s ability to pivot quickly and innovate ultimately determines their success, and a collaborative environment is a crucial factor. By encouraging stronger cross-functional collaboration, you can ensure your business remains competitive – no matter what is thrown at it. Want some tried-and-true techniques for effectively breaking down silos? Check our our free ebook Breaking Down Silos: How collaboration can accelerate your business’ growth. Download it now!